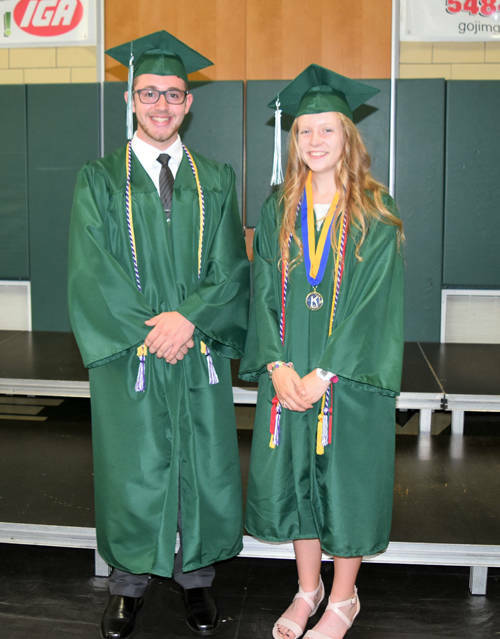 Tyler Strait (left) and Hayley Maher each received a $2,500 provisional scholarship (renewable for four years) from the Jan and James Thomas Fund of the Darke County Foundation. 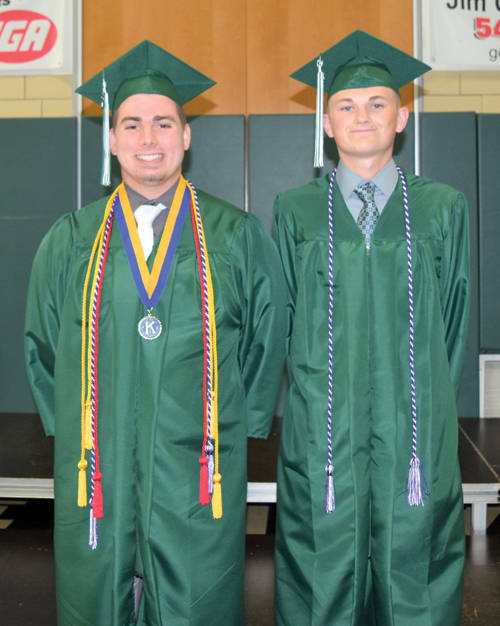 Landin Brown (left) and Jacob Subler each received a $2,500 provisional scholarship (partially renewable for four years) from the Harold and Betty Brewer Fund of the Darke County Foundation. The Darke County Foundation awarded scholarships to 12 graduates of Greenville High School class of 2018. Pictured are (front row) Katelyn Avore, Mikayla Bailey, Taryn Cooper, Sierra Cress, Kourtney Kretschmar, Hayley Maher, (back row) Landin Brown, Ryan Schwieterman, Grace Coakley, William Coomer, Tyler Strait and Jacob Subler. 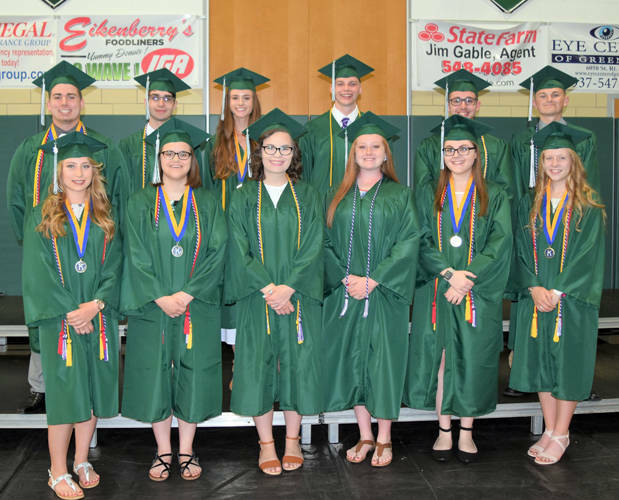 GREENVILLE – The Darke County Foundation awarded $20,000 in scholarships to 12 members of Greenville High School class of 2018. These recipients will receive between $1,000 and $2,500 following successful completion of one semester in college: Katelyn Avore, Mikayla Bailey, Landin Brown, Grace Coakley, William Coomer, Taryn Cooper, Sierra Cress, Kourtney Kretschmar, Hayley Maher, Ryan Schwieterman, Tyler Strait and Jacob Subler. 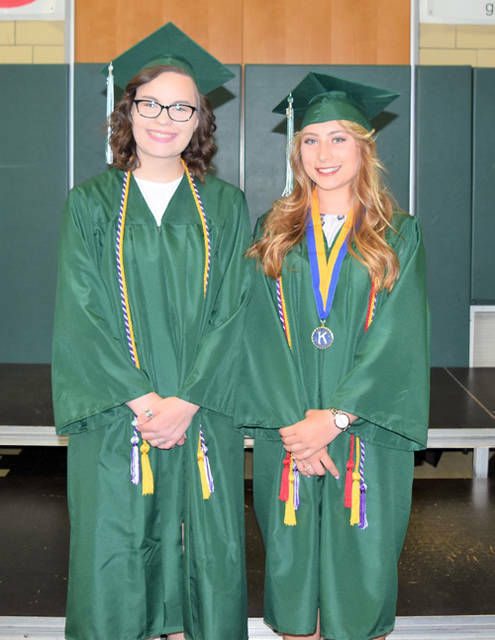 This year the Darke County Foundation will award more than $160,000 in scholarships to more than 100 graduates of eight Darke County high schools. Award money comes from foundation funds that have been established by individuals, families and businesses interested in supporting Darke County students. Invested long-term, many funds generate a continuing source of income and maintain lasting legacies for years to come. Donors often honor family members or a special purpose by setting up funds with personalized names. The following Darke County Foundation funds provided scholarships for Greenville class of 2018: Harold and Betty Brewer Fund; Millie Kiger Dunaway Art Fund; Galen and Blanche Fourman Fund; Jeanie and Jeff Hawley Fund; Susan J. North Art Fund; Schipfer Family Fund; Edwin, Mac & Marguerite Stoltz Fund; Jan and Jim Thomas Fund; Paul C. and Helen D. Warner Fund. The Darke County Foundation is a community foundation dedicated to improving the lives of Darke County residents by receiving, managing and distributing charitable gifts. Since beginning in 1986, the foundation has awarded more than $2.3 million in scholarships and community grants to local non-profit organizations. For information on starting a charitable fund, contact the Darke County Foundation at 548-4673 or visit its website at www.darkecountyfoundation.org.